Offering compatibility to a wide variety of graphic cards, the Scythe MUSASHI Twin-Fan VGA Cooler is prepped to deliver extreme cooling to everything from the ATI Radeon 9000 to the nVIDIA GeForce FX5900. This ultra-thin VGA cooler features an Independent Dual Fan with Controller that will handle everything from super-silent performance to extreme overclocking. To help maximize it's cooling abilities, various memory heatsinks are included in the Scythe Musashi, which is also aided by enhanced air-through construction to ensure the complete cooling of your graphic card. 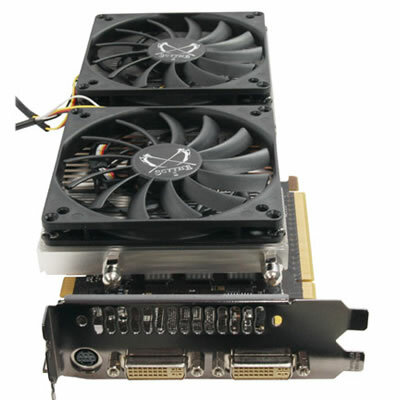 In addition, the Scythe MUSASHI Twin-Fan VGA Cooler also offers an optional single fan mode, which can be arranged by simply detaching one fan and placing another into the middle of the VGA cooler(delivering an intense amount of cooling directly to the GPU).